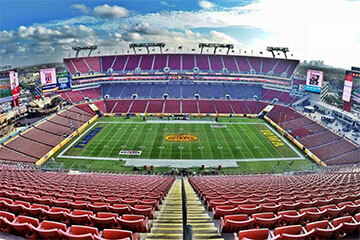 Raymond James Stadium is home to the Tampa Bay Buccaneers, University of South Florida Football, Outback Bowl, Monster Jam, Gasparilla Bowl and the XFL. The stadium seats 65,618. With the addition of temporary seating, it can be expanded to 75,000 for special events. Following the completion of the initial phase of a $140-plus million multi-phase renovation in 2016 , Raymond James Stadium now boasts the most technologically advanced HD video system in use today. It is comprised of two massive 9,600 square-foot boards on the north and south ends of the stadium – and four large 2,300 square-foot HD tower walls. With more than 31,000 square feet of video display space, this system ranks as the third-largest video board system in the NFL.